The Toronto Maple Leafs begin another championship quest on Thursday evening at TD Garden against the Boston Bruins. The Maple Leafs don’t need to be reminded that May 2 is the 52nd anniversary of the last time the storied franchise won a Stanley Cup. They don’t need to be reminded that this restless club has not won a single playoff series since 2004. The heat is on and no one is in the hot seat more than Toronto’s 55-year-old head coach Mike Babcock. It’s not the high-priced unrestricted free agent John Tavares. It’s not the young stud Auston Matthews, who scored only once in Toronto’s seven-game loss to the Bruins in the first round a year ago. It’s not even goalie Frederik Andersen, who played so brilliantly for the most part this season but stumbled in the late going with only four victories in his last 12 outings. Andersen also has lost his last four playoff series. But this spring is on Babcock. Even though the Bruins are favoured in this opening-round matchup, Babcock dearly needs to celebrate a series win. Sure, the highest-paid hockey coach, who is in his fourth year in Toronto after inking a whopping eight-season $50-million US contract, is one of the most decorated bench bosses around. In the last 25 years, he has won a University Cup (1994), a world junior title (1997) and a World Cup of Hockey championship (2016). He also is the only coach to have won titles at the word championship (2004), the Stanley Cup with the Detroit Red Wings (2008) and gold medals at the 2010 and 2014 Olympic Games. He has been the victor 690 times in his NHL coaching career. He has celebrated 87 wins in the playoffs and his teams have qualified for the post-season an impressive 14 times in 16 seasons. But at some point, Babcock needs to be on the right side of a post-series handshake in the Stanley Cup playoffs with the Leafs. When it comes to this time of the year, his stellar reputation has taken a hit in the past decade. In 2009, his Red Wings had a 3-2 series lead in the Stanley Cup final. The Pittsburgh Penguins, however, scored a pair of 2-1 wins in Games 6 and 7 to steal the series. In 2011, Babcock and Detroit fell behind 3-0 to the San Jose Sharks and Todd McLellan, Babcock’s former assistant with the Red Wings, only to storm back to tie the second-round series. But Detroit was a dud in the finale. In 2013, the Red Wings had a 3-1 second-round series lead over the Chicago Blackhawks but could not close the deal. In 2015, Detroit enjoyed a 3-2 series lead against the Tampa Bay Lightning, but the Red Wings were outscored 7-2 in the final two games and once again were sent to the sidelines for the season. Babcock has yet to win a series in Toronto. 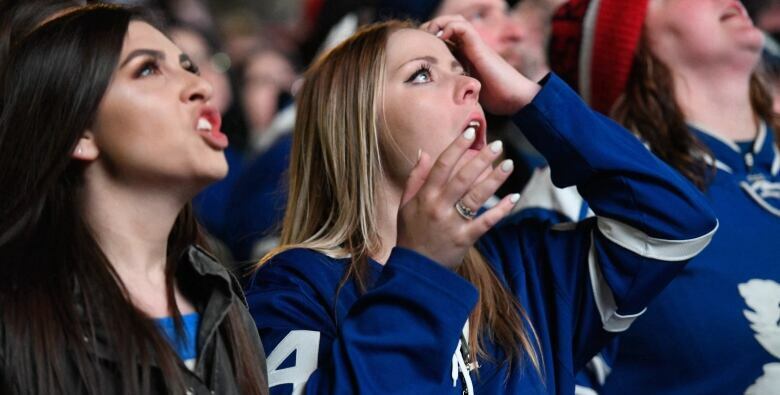 After the Maple Leafs missed the playoffs in his first year, Toronto faltered in 2017 after winning two of the first three games against the Washington Capitals, only to lose the first round in six games. Last spring, there was more heartbreak. The Maple Leafs forced a Game 7 and built a 4-3 lead after 40 minutes in the finale against the Bruins but, in the end, were beaten 7-4. This season, despite the addition of Tavares, the Maple Leafs finished with five fewer points. They went a middling 10-10-5 in their closing 25 games. Babcock pleaded innocent but he was guilty of sending subtle verbal shots at Maple Leafs general manager Kyle Dubas for not adding more depth at the trade deadline. The Maple Leafs head coach also has been criticized for making his team too predictable. He has been criticized for playing veterans over his young talent, but Toronto’s top three forwards are rather close in average ice time — Mitch Marner (19 minutes, 49 seconds), Tavares (19:05) and Matthews (18:33). A stubborn Babcock also has been lambasted for playing Andersen too much as he didn’t like the backup (Garret Sparks) he was saddled with this season. But, as mentioned, Andersen wasn’t good in the late-going of the season and there are questions as to whether he’ll have anything left for the playoffs. Maybe the Maple Leafs aren’t ready to win. Maybe they’re too thin on the blue-line. Maybe this team isn’t built for the playoffs and it can’t handle physical teams like the Bruins up front and on the back end. But isn’t this a situation where a head coach with Babcock’s pedigree can make a difference? Isn’t it time for a high-priced coach like Babcock to steer a team to some spring-time success?